SLA NY Chapter News: Are You From Osage? At an early fall SLA-NY advisory committee meeting several years ago, Rita Ormsby, sitting next to Leigh Hallingby, inquired about her summer. Leigh said she had visited Iowa for the first time. Rita asked, “Oh, where did you go?” Leigh replied, “Oh, somewhere you have probably never heard of.” To which, Rita, an Iowa native replied, “Try me.” And, when Leigh said, “Osage,” Rita remarked, “I know it well. My dad grew up on a farm in Little Cedar, which is about six miles northeast of Osage.” They agreed it was a small world if two people sitting next to each other at a meeting in New York City had a connection to Osage. 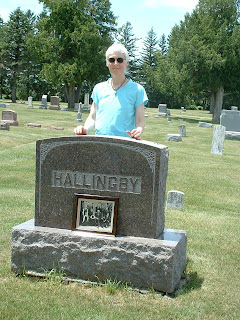 But, Rita knew that SLA-NY member Tom Nielsen also had a connection to this northern Iowa town of 3,460.
the lower right is Paul Hallingby, who became Leigh's grandfather. One of my favorite family photos is of my Hallingby ancestors right around the turn of the 20th century. There are my great grandparents, Ole Olson Hallingby and Ingeborg Johansen Hallingby and their nine children, seven girls and two boys. This large, dour-looking Victorian family lived in Osage, Iowa, to which Ole had emigrated in 1869 from Hallingby, Norway, a small village about an hour north of Oslo. One of his two young sons, Paul Hallingby, about seven at the time of the photo, eventually became my grandfather. My father, Paul Hallingby, Jr., remembered his grandfather Ole as a “grumpy old man,” who, when someone asked him how he was, would reply: “Rotten!” Fortunately, Ole’s obituary gives a more positive impression of a carpenter who helped build many familiar landmarks in Osage. Ironically I traveled to the town of Hallingby, Norway (population 833), a decade before I managed to get to Osage thanks to a 300th anniversary family reunion in 1996. We crossed the Atlantic to celebrate the 1696 building of the Hallingby homestead, a log cabin still in the family. I longed for many years to visit Osage as well, so that I could stand on the corner of 6th and Chestnut, where the Norwegian/American Hallingbys had lived. My wish came true in 2007 when my sister Allison suggested that we take our annual summer baseball trip to Iowa to attend a Des Moines Cubs game on Friday, July 6th, and then head up to northern Iowa the next day. And so it happened that on Sunday morning July 8, 2007, I was indeed standing on the exact corner where the Hallingby family had lived. There was no way of knowing if their house was still standing. But no matter, it was still a thrill to be there. After seeing the corner where the Hallingbys resided, Allison and I headed to the town cemetery to look for the graves of Ole and Ingeborg. To our delight, the cemetery was, like any self-respecting library, well cataloged. The broiling hot Iowa day made us appreciate this even more. A directory at the entrance told us exactly how to find the grave. In a New York minute, there we were at the Hallingby headstone which commemorated the lives of Ingeborg and Ole, as well as that of an infant son Oscar. We couldn’t get over the ease of finding the gravesite, nor over the rows of corn coming right up to the edge of the cemetery! My grandmother, my father’s mother, is my connection to Osage, Iowa. Before she married my Grandpa Kasper, May Gilbert lived on a farm near Osage in a typical large farm family, three girls and six boys. Two of her brothers, John and Lawrence, bought neighboring farms just outside Osage and when I was a child my family would escape the suburbs of St. Paul, Minnesota, to visit them quite often. Uncle Lawrence and his wife Sylvia had seven kids and, when my family of six came calling, you had a loud and lively bunch. As a city kid, I was not interested in the farm animals and crops so I usually stayed in the house, but there was a good reason why. Lawrence and Sylvia had one memorable toy that thrilled any visiting child. It was a multi-tiered wooden ramp for marbles. I loved dropping those marbles one at a time onto the top ramp, watching them roll into a pocket at the end and onto a second ramp, then down to another pocket to a third ramp and finally landing with a sharp clink into a tall coffee tin. The appeal of this toy was not just the novelty of watching marbles roll down each ramp, but of putting all the marbles onto the ramp and waiting for them to drop noisily into that coffee tin, a prolonged and distracting clattering that, to my delight, stopped all conversation in the room. I recall one visit when all eleven kids, including my older sister and two brothers and I, piled into one of their old cars and drove down the dusty dirt road they lived on. To a city kid, this kind of freedom was unheard of, so when someone asked if I wanted to steer the car I jumped at the chance. I sat on my sister’s lap and steered with a white-knuckle grip, a mix of fright and abandon. But as if fate were checking our fun, one of the tires went flat ending that escapade. Uncle John’s house could not have been more different. He was a preacher at two churches in the area and he and his wife Agnes had no children, but I recall with fascination that their home was decidedly low tech. They cooked and heated with a big cast iron wood-burning cook stove in the kitchen. They had an old pump organ in the living room where I got a leg workout practicing my piano lessons. Without a TV, they passed the time playing card games and surprisingly entertaining games with dominoes. When that got tiring, they had a badminton net set up in the front yard. The fact that this was also a sheep grazing area added an extra challenge because city kids do not want to get sheep dung on their shoes. This past summer my partner and I drove back to the Midwest for an extended vacation and during our stay we made a bittersweet visit to the Osage cemetery. There I was able to see for the first time the graves of my Grandma May and Grandpa Kasper, my Great Uncle John and other Gilbert family members. In a new section of the cemetery I found my father’s new headstone laid in August 2009. Although it is tough to bid farewell to close relatives, it is also nice to enjoy fond recollections with those that are still alive and I was able to do that with Aunt Agnes, Uncle Lawrence and Aunt Sylvia, all in their 90’s, during that trip to Osage. So back in NYC, far from the Osage cemetery and farmsteads, having a couple colleagues to share these memories with is, well, almost as thrilling as dropping marbles into a coffee tin. My father’s family moved to the Little Cedar farm in the 1920s from another Iowa farm community. My grandmother, Olive, drove a Model-T with her three young sons while her husband, Thomas, traveled by rail with the livestock. My grandparents and their sons raised hogs for breeding purposes, and chickens for eggs for sale in Osage. I’ve realized over the years that my dad’s youth was during the Great Depression, and times were tough. A baseball diamond in one of their fields drew neighbor families for Sunday afternoon games. Although Little Cedar’s Main Street once had a school, bank, post office, creamery and general store, only a feed store and a welding shop remains today. My dad was proud that he was third in his Little Cedar high school class, but there were only four graduates. My dad left the farm to become a civil engineer, serve in World II, and then married and reared his family elsewhere in Iowa. Unfortunately, his brothers were killed during World War II, and today no family resides in the area. By the early 1950s, my grandparents had retired to an acreage on Osage’s western edge. It was next to the A&W drive in, and for my sister and two brothers and me, there was not a better place for grandparents to live. I recall after a day into a week-long visit, A&W limited the free “kiddie root beer” we could have. Another time, I helped my grandfather gather eggs into a wire basket. I insisted I was big enough to put the basket on the kitchen counter for grandma. We had a very large number of scrambled eggs for breakfast that day. Although my dad died several years ago, family members still visit Osage and Little Cedar frequently. The largest private employer in Osage is the Fox River Mills Company, which makes the Rockford red-heeled work socks, often used for monkey sock dolls. Since 30 years ago, when I made a monkey doll, at my sister’s request for my new-born nephew, I’ve made about 50 such dolls. It helps me stay connected to my Iowa roots. And, yes, I like the Kia Sorento commercials featuring the sock monkey. He made it to New York too. Chapter News reports on the upcoming activities of our many groups and committees, announces upcoming events, and highlights the extraordinary work being done by members of the New York Chapter of the Special Libraries Association. New York Chapter. All rights reserved.